When facing a garden full of weeds, you may be tempted to pull out the weed block for your beds. While this may be great choice for strictly utilitarian areas in your garden, such as street easements or areas that get a lot of foot traffic, weed block is typically not a good solution for your flower beds. Healthy soil and plant root systems will naturally reduce weeds in your lawn and garden. While weedblock is a good product to put down under graveled areas or mulched pathways, it’s rarely the fool-proof product you’ll hope it will be. For instance you may believe that no weeds can grow through the weed block. Unfortunately you will find that is simply not the case. The weeds can pierce through the fabric and removing them is less effective because you usually cannot remove the roots fully. If weeding is not your favorite task, try staying one step ahead of them by removing weeds before they flower and set seed. Fully removing them and their entire root system will also cut down on future weeds. It might take some time, but your weed population will decrease over time. Get to know your weeds and why they are growing in your landscape. When weed block is put down in landscape beds, know that you’ll probably miss out on seedlings from your favorite plants that you want to germinate. 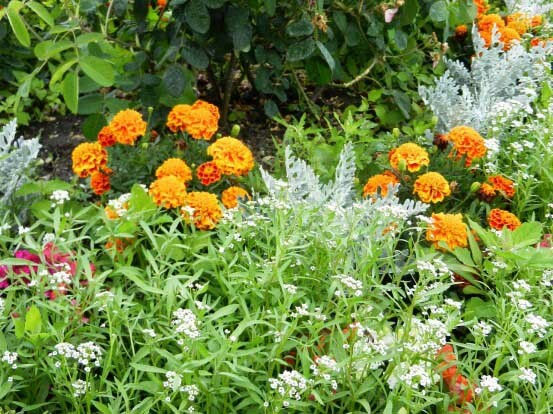 Zinnias, basil and many other annuals, perennials and herbs can put down seeds you may want grow. Because the weed block blocks organic matter from decomposing and integrating into your soil, weed-block can actually make soil compaction worse. Compacted soil leads to death of the microbes in your soil, which in turn means less nutrients available for your lawn and plants. Aeration is reduced and drainage can be impaired. If you choose to be organic or environmentally friendly, you will find that weed block is neither. Most weed blocks are petroleum based and cannot be recycled once you’re ready to dispose of them. Unwanted chemicals in weed block can taint your vegetable crops or other edibles. The cost of weed block often outweighs the benefit. Along with the weed block you must purchase the metal pins that keep it in place. When covering a large area the cost can grow quickly. Again, weed-block can serve a purpose when installed under hardscape materials and walkways. We just don’t think it’s the right solution for areas where you want to grow healthy garden plants. If you still have a trouble area where you just can’t seem to get rid of persistent weeds, consider placing a 2-3” layer of mulch or even attractive stones or pebbles smother and suppress weeds.